I miss living in Prague. His words are true for any traveler, but I wanted to validate them for myself by putting my footprints in as many parts of the city as possible. 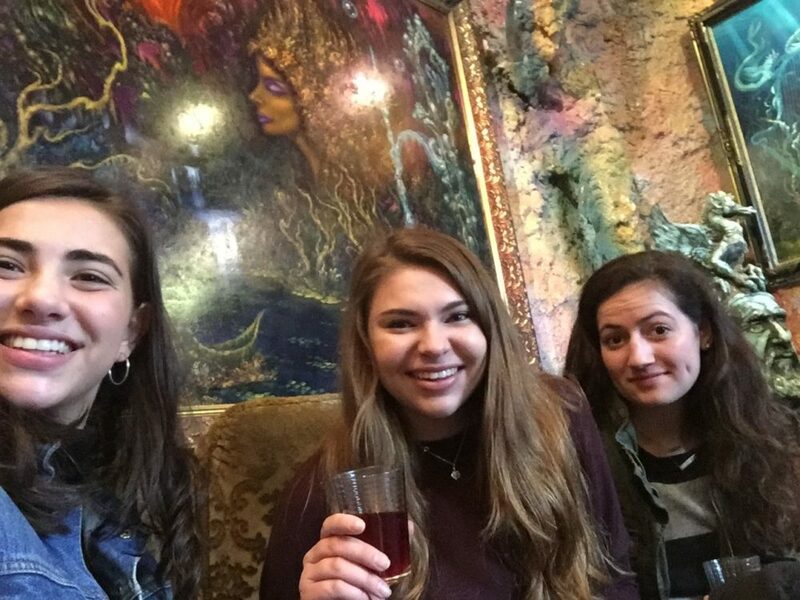 On the weekends that my roommates and I stayed in town, we planned “Prague Days,” which consisted of us leaving the apartment before lunch and traipsing through our own city until dinnertime. Our goals were to check landmarks and restaurants off our “must-see” lists, and to discover nooks we’d never heard of and experience Prague’s best kept secrets. On one of our outings, we went halfway up Petřín Hill, in search of the “Magical Cavern” that is quite easily missed during the first venture through the area, unless you know what you’re looking for. When we located the small, stealthily camouflaged cottage, we were greeted by a very tipsy man in wizards’ robes, who asked us if we wanted to explore the ancient cavern inside. We enthusiastically affirmed him with our monies, and he proceeded to poke me on the nose and shake one of my roommates’ shoulders, to ensure us that he was ecstatic at our decision. We were then told to enjoy the sangria in the basement. Sometimes, while abroad, a collective thought would run through our minds, and it consisted of the five words, “What have we just done?” This was one of those times. While the wizard continued to man his post, the five of us made our way down a wrought iron spiral staircase, and were suddenly delved into a cabin completely wallpapered in the most fantastical paintings I’ve ever seen. They shimmered with images of mermaids, magical kingdoms, unicorns, and the like. Stalactites dangled from the ceilings, and the walls were so heavily calcified that it gave the sensation that we’d discovered the lost city of Atlantis, or were diving through the ruins of the Titanic. When we got to the bottom of the stairs, we entered said “basement,” which actually gave more the atmosphere of a family room. The place was empty when we arrived, so we poured ourselves glasses of the questionable sangria that sat in pitchers on the coffee table, and settled in on the cozy couch for story-time. Story-time, mind you, is not included in this experience; it was provided by our very own roommate, Amanda, who began her tale by immersing herself in the fantasy world of the art that surrounded us. It was spooky. It was interactive. It took some very inappropriate turns, per Amanda’s imaginative mind. It came to an unsettling halt when she suggested that the cups of sangria in our hands were poisonous, at which time we all set them down and decided it was time to peruse the rest of the underground. The majority of us, myself included, would highly recommend the Magical Cavern. 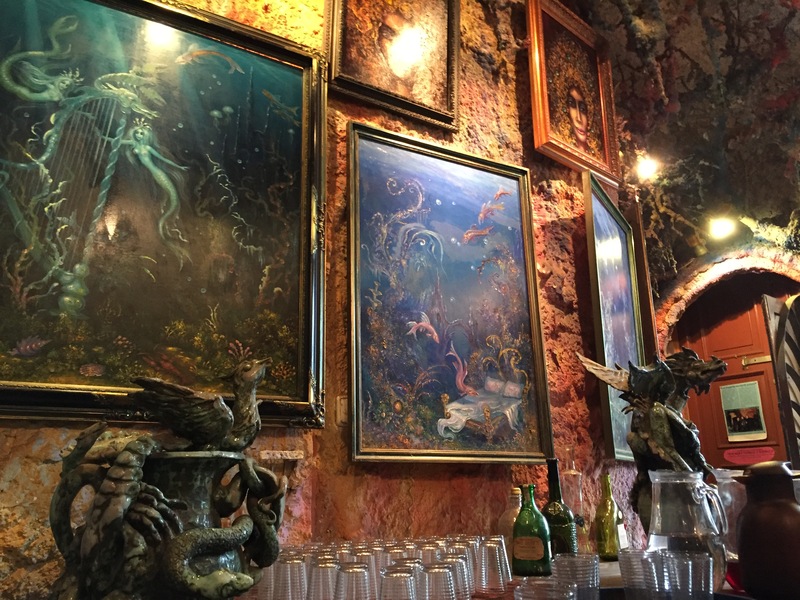 The original art filled every room, and made the experience feel like a mystical exploration— like I had stepped into Narnia and stumbled across a cottage there. It was unlike anything else we had done, or would later do, in Prague. This was just one of our many, many discoveries, but it sticks out. Perhaps it was the mysteriousness of the place. Perhaps it was its killer location; halfway up a park full of brilliantly colored trees, overlooking a city of orange rooftops, and located at one of the best vantage points of the Prague Castle for miles. Perhaps it was even the jovial spirit of the tipsy wizard that did the trick. All contributing factors, company included, are what made the Magical Cavern, magical for me. I loved every outing we made in Prague, but the clarity is still crystal for me on that one. I know that there are more secrets to the city out there that we didn’t make it to this time, and I’m dying to know what they are. And when I say “this time,” I’m not only implying that there will be a “next time”; I am declaring it.